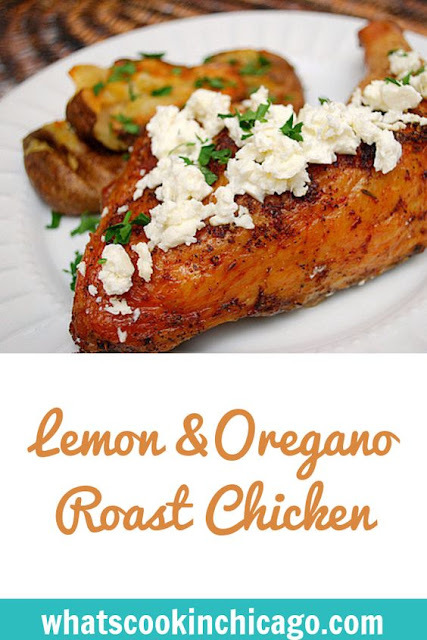 Lemon, oregano and feta complement each other so well. It's evident in many Mediterranean cuisines and together, they give a bright flavor to dishes. Chicken is great way to highlight these flavors and in this dish, it's so easy to do... even well in advance. I adapted the original recipe by adding a few more seasonings and aromatics to infuse more flavor. I also prepared this as a make ahead/freezer meal. Doing so may have even allowed the flavors to permeate the chicken further. But regardless whether you make ahead or not, the dish is perfect for the season and is great on the grill too! I served this with a green salad and Hot Crashed Potatoes. Heat the oven to 375º. Coat the chicken with the oil; arrange the pieces, skin-side up, in a large roasting pan. Sprinkle the chicken with the oregano, minced garlic, poultry seasoning, lemon juice, salt, and pepper. Cook the chicken until the breasts are just done, about 30 minutes. Remove the breasts and continue to cook the legs until done, about 5 minutes longer. Remove the roasting pan from the oven; return the breasts to the pan. 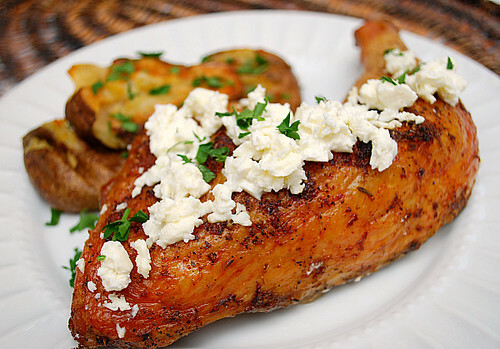 Serve roast chicken and garnish with crumbled fresh feta cheese and minced parsley. * To make ahead/freezer meal - Coat the chicken with the oil; sprinkle the chicken with the oregano, garlic poultry seasoning lemon juice, salt, and pepper. 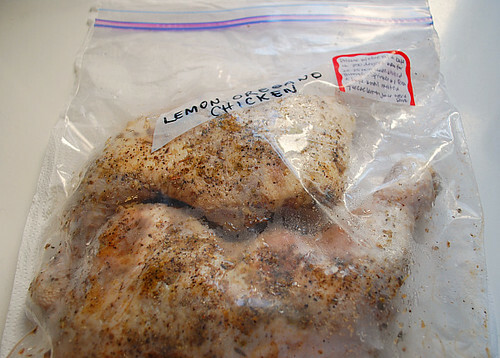 Place the pieces in a large gallon sized freezer bag. Squeeze out any excess air, seal and freeze. When ready to prepare, defrost. Preheat the oven to 375º. Place chicken on baking sheet and bake in preheated oven. Cook the chicken until the breasts are just done, about 30-40 minutes. 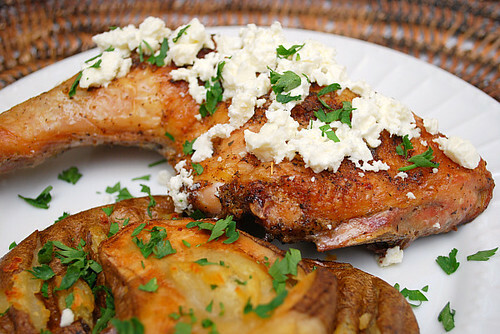 Serve roast chicken and garnish with crumbled fresh feta cheese and minced parsley. Absolutely gorgeous...some seriously delicious color on that chicken! This looks delicious. I especially like the feta cheese you add at the end, a nice touch. Sounds fantastic and I agree with TKTC, the caramelization on the skin is beautiful and no doubt added so much flavor. What a delish combo! Those potatoes look drool-worthy as well! This looks so delicious! I like the way you roasted the chicken. Perfect color! This is one of my favorite recipes. We love to let it sit and marinate for 24-48 hours then grill it. It's a hit every time!